B.Sc., Ba.Lit.C, PhD.Sci.C Mei studied electronic engineering at University in Shanghai P.R. China before working as design engineer for the “Shanghai camera factory No. 1″(later to become the Seagull Camera factory). After leaving China for further studies she has worked for Nikon and Pentax camera repair departments, repairing medical fibrescopes. Mei does most of the camera body repairs for Shutter-Box. After completing his GCE O & A levels at university in England and the USA, John has worked for 20 years working on fiberoptics in relation to Gastroenterlogy in Australia, Germany, Italy & Japan. 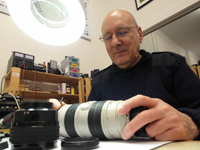 John does most of the lens repairs as well as repairing movie projectors, AV equipment. Shutter-Box is a small family business specialising in the repair and servicing of all makes and models of photographic equipment for both professional and amateur photographers. We realise that the value of your camera often goes beyond it’s dollar value so if it can be repaired will will give you all of the options available and let you decide if it is worth it. Shutter-Box also service projectors, film and video cameras.